New tanker Damia Desgagnés aground near Mariatown. 6/16 - Massena, N.Y. 3 p.m. update – St. Lawrence. Seaway traffic is temporarily suspended until a ship that went aground Thursday evening near Iroquois Lock is back in the channel and continuing on its journey. Andrew K. Bogora, communications officer for the St. Lawrence Seaway Management Corp., said the Damia Desgagnés, on her first trip up the Seaway, went aground Thursday night just east of Iroquois Lock because of a mechanical issue and, as of early afternoon Friday, was resting against the side of the channel. “There’s no pollution observed and no injuries. The vessel currently has one tug on station and another tug is en route. Once the second tug arrives, they will simply pull the vessel back into the channel and it will be on its journey,” Bogora said. Until then, vessel traffic has been halted on the Seaway, he said. “We are currently seeing higher water flow. In a typical season we would contemplate allowing ships to pass by. However, given the higher-than-usual water flows, we’re being extra cautious,” Bogora said. However, he added, the grounding had nothing to do with the high water flows. “It was simply a mechanical issue,” he said. The 442-foot-long vessel was built in Istanbul, Turkey, and is owned by Quebec-based Groupe Desgagnés. According to the company’s website, Damia Desgagnés is an asphalt tanker propelled by dual-fuel engines allowing the use of liquefied natural gas (LNG), marine diesel oil (MDO) or heavy fuel oil (HFO). Meanwhile, the saltwater vessel Alina has made her way upbound at the Iroquois Lock, which has been closed since the tanker Chem Polaris struck a ship arrestor bar, damaging the cable within, on Thursday. The downbound Vikingbank and Baie St. Paul were still on the lock wall as of 2 p.m. Friday, as was Chem Polaris, as crews worked to repair the cable. 6/18 - The tanker Damia Desgagnés, which was freed Saturday morning after going aground Friday on the St. Lawrence River between Iroquois and Morrisburg, Ont., is docked at Johnstown, Ont., for inspection and possible engine repairs. The grounding has been blamed on a mechanical problem. This is the new tanker’s maiden voyage in to the Seaway system. The Transportation Safety Board of Canada is investigating the incident. 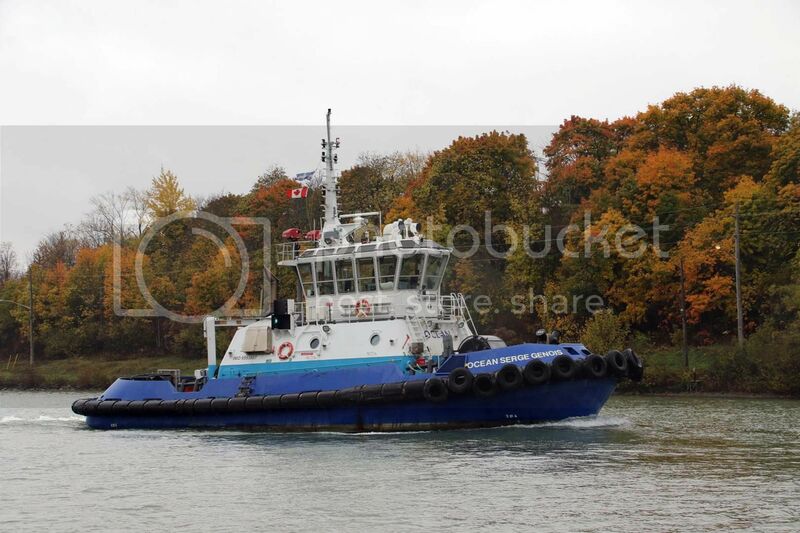 The tugs Ocean Georgie Bain and Ocean Serge Genois pulled the vessel free and escorted her to the dock. The tanker was traveling west from Montreal to the Lake Erie community of Nanticoke in Ontario when the engine failed, according to Serge Le Guellec, the president of Transport Desgagnés, a wholly-owned subsidiary of the Quebec-based Group Desgagnés. After the engine failed, the ship drifted and ended with its nose grounded on sand about three nautical miles east of Iroquois, Ont., Le Guellec said. The ship was carrying what he described as heavy fuel, but he said no spill has occurred. een van de sleepboten bij het los trekken van de tanker. Zie? Het is gewoon binnenvaart in het groot. Zelf door kanalen en kunstwerken varen, aan de motor sleutelen, ga zo maar door. Mooie foto's. Vooral die foto dat de kap door de brug vaart vind ik fraai. Gewoon in t-shirt, geen loods in de buurt. Die mannen kunnen tenminste nog varen. Inderdaad, gewoon vakwerk van de bovenste plank !. Enne, op The Great Lakes kan het ook nog eens behoorlijk spoken. De grootste schepen kunnen er domweg vergaan. Petje af voor deze varensmensen. Maar wat gebeurd er met deze bemanningen gedurende de opleg periode gedurende de winter ?. Ben ik eigenlijk best wel nieuwsgierig naar. De bemanningen van de opgelegde schepen gaan naar huis, vacantie, en worden bij het begin van het nieuwe vaar seizoen weer terug geroepen en over het algemeen gaan zij dan naar het zelfde schip terug. Nu is het 6 weken op, 3 weken thuis. Wat de tegenwoordige contracten zijn, heb ik geen weet van. St. Marys Challenger, with a load of cement, squeezes through the narrow Kinnickinnic River to the terminal at Milwaukee in 2006. Eventually, age catches up with you. St. Marys Challenger lived up to its name by defying that assertion longer than its counterparts. But after 107 years, the laker was taken out of service in November 2013 to be converted to a barge. 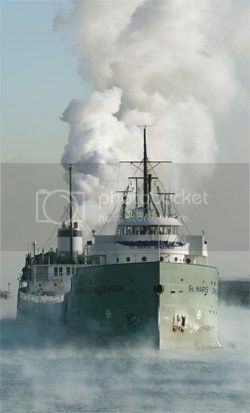 Built in 1906, Challenger was the oldest operating freighter on the Great Lakes. The decision to convert the 551-foot cement carrier followed a series of upgrades spanning several decades, including extensive hull rebuilding, installation of a self-unloading cargo system and a myriad of other structural upgrades. In the end, the owner was left with a Skinner Marine Uniflow four-cylinder reciprocating steam engine burning heavy fuel oil, outdated DC electric and an aged mechanical propulsion system that made operating the boat an ever-increasing expense. 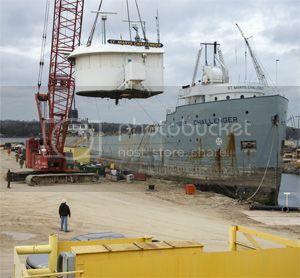 The laker arrives at the mouth of the Calumet River in South Chicago, Ill., in 2005. Repairing an older vessel can be a great burden for owners. SS Badger is the last remaining coal-powered ferry operating on the lakes. When it’s in need of repairs, parts are taken from its twin ship, SS Spartan, said Caitlin Clyne, registrar and collections manager at the Wisconsin Maritime Museum in Manitowoc, Wis. Port City Marine, based in Muskegon, Mich., considered its alternatives, including retrofitting Challenger with a diesel engine. Not only would that have cost about $20 million — nearly double the barge conversion project — but it would have saddled the company with ongoing expenses. And while a crew of 25 was needed to operate Challenger, the articulated tug-barge (ATB) can operate with 11. The company will also save money on fuel, as the vessel burned a considerable amount even just sitting at the dock, Hogan said. Aging machinery and stricter fuel regulations, coupled with would-be requirements following Challenger’s five-year mandatory inspection this winter, led the owners to decide on conversion to an ATB. It was the most cost-effective option, Hogan said. In November, Challenger took its final self-propelled voyage from Chicago to Bay Shipbuilding Co. in Sturgeon Bay, Wis., blowing its steam whistle and flying a white flag as it arrived. Historical artifacts, including the wheelhouse and engine room telegraph system, were removed and are expected to be donated to a museum. Asbestos was extracted from the boiler, and bunker tanks were scrubbed clean. The crew quarters, boiler, engine, generators and piping and plumbing apparatus were stripped from the vessel, along with flammable materials. 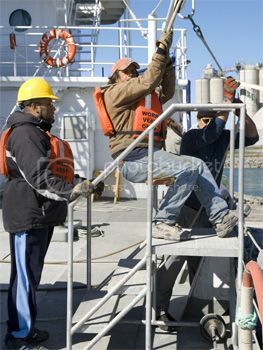 The deck crew uses a bosun’s chair to lower deck hands to the dock for line-handling operations. Bosun Dave Knuth, right, gets ready to swing the boom out. The fore and aft superstructure was removed before torches helped cut off the stern while the boat was still in the water. 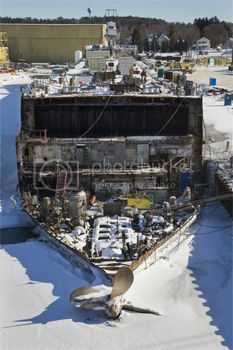 The remainder of the stern was to be removed after the ship was placed in dry dock in March. Bay Shipbuilding will then attach a new stern that’s being fabricated in several pieces. The ballast system, which was steam-powered, will be completely replaced to meet modern construction requirements. After the work is completed and Challenger returns to the Great Lakes, it’ll be pushed by Prentiss Brown, which currently powers St. Marys Conquest, another Port City Marine vessel that was converted from a steamer to a barge in 1986. “We have a second Bludworth tug — the Bradshaw McKee — that will push the Conquest,” Hogan said. “Both tugs will be completely interchangeable. The ATB will burn much cleaner fuel, and the owners expect it to carry more cargo. The owners won’t be sure how much until construction is complete. Demolition of Challenger’s lapped-and-riveted counter stern is nearly complete at Bay Shipbuilding in January. 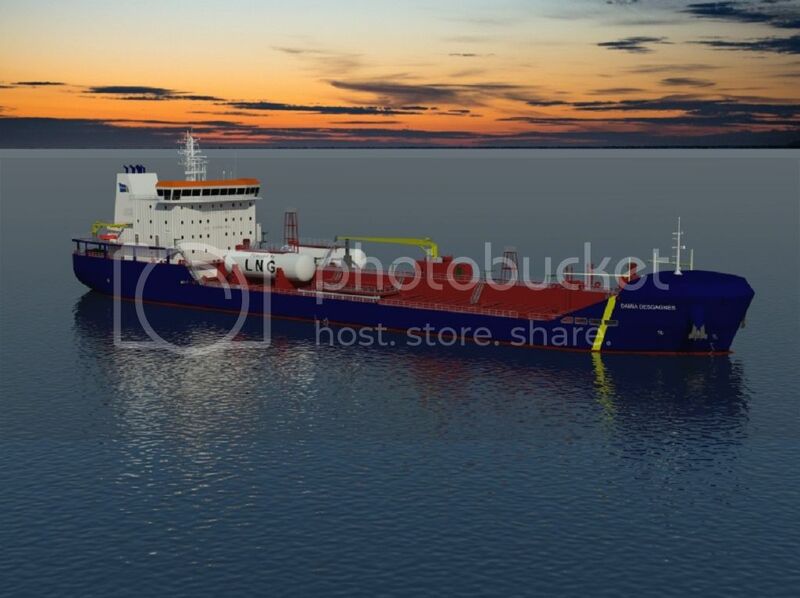 The process was necessary to prepare the vessel for service as part of an articulated tug-barge. 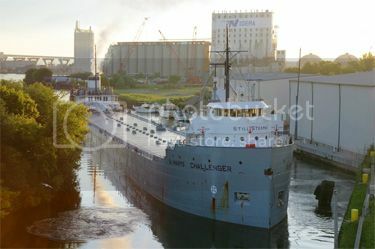 Expected to return to the Great Lakes by June, Challenger will maintain its name, and will continue to carry powdered cement from St. Marys Cement Co.’s elevator in Charlevoix, Mich., to South Chicago, Milwaukee, Manitowoc, Wis., and Grand Haven, Mich.
Capt. George Herdina, of Sturgeon Bay, recalled maneuvering the laker through the canals of Chicago with machinery from a bygone era. “There were a few times we lost the steering,” said Herdina, who spent 19 years as captain of the ship before retiring in 2009. “You’ve always got an engineer at the throttle in the engine room on that, because it’s not automated. Challenger’s pilothouse is lifted intact from the forward end. The structure and its contents will be displayed at the National Museum of the Great Lakes in Toledo, Ohio. Many companies decided to scrap freighters like Challenger in the ’80s for more modern vessels, said Clyne. Museums are doing their part in preserving the ship’s history. The Wisconsin Maritime Museum obtained several engine logs, deck logs, blueprints and other artifacts before the conversion work began on Challenger. On approach to Bay Shipbuilding, watchstanders wait for final engine orders to ring through on the telegraph. It was Challenger’s last voyage under steam. 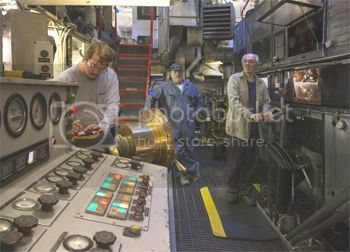 From left, 3rd assistant Andy Vervelde, chief engineer Dave Jarvis and 2nd assistant Bob Sincavage, who is doing the shifting.